University of Texas Press, 9781477315736, 336pp. "Burle Marx created a new and modern grammar for international landscape design." "The real creator of the modern garden." Roberto Burle Marx (1909-1994) is internationally known as one of the preeminent modernist landscape architects. He designed renowned public landscapes in Brazil, beginning with small plazas in Recife in the 1930s and culminating with large public parks in the early 1960s, most significantly the Parque do Flamengo in Rio de Janeiro. 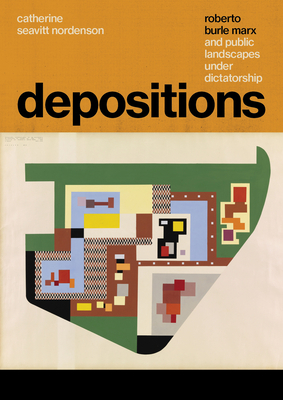 Depositions explores a pivotal moment in Burle Marx's career--the years in which he served as a member of the Federal Cultural Council created by the military dictatorship in the mid-1960s. Despite the inherent conflict and risk in working with the military regime, Burle Marx boldly used his position to advocate for the protection of the unique Brazilian landscape, becoming a prophetic voice of caution against the regime's policies of rapid development and resource exploitation. Depositions presents the first English translation of eighteen environmental position pieces that Burle Marx wrote for the journal Cultura, a publication of the Brazilian Ministry of Education and Culture, from 1967 through 1973. Catherine Seavitt Nordenson introduces and contextualizes the depositions by analyzing their historical and political contexts, as well as by presenting pertinent examples of Burle Marx's earlier public projects, which enables a comprehensive reading of the texts. Addressing deforestation, the establishment of national parks, the place of commemorative sculpture, and the unique history of the Brazilian cultural landscape, Depositions offers new insight into Burle Marx's outstanding landscape oeuvre and elucidates his transition from prolific designer to prescient counselor.